Sunita had to sell her jewelry for her grocery shop. But, over the years, with the help of several loans from her women’s self help group, she expanded her business and could repay the loan. Sunita’s standard of living has changed substantially and she is now having her house expanded, of which the construction is still carrying on. She now has a motor cycle, and a mobile phone is next on her list ! Tarawati and her husband engaged in a business which incurred heavy losses and they were reduced to total penury. Tarawati became a member of the Sita Group in Kutail Gamri Village and started participating in entrepreneurial trainings facilitated by Arpana. She then learnt machine embroidery in Karnal. She took her first loan of Rs.7000 to buy an embroidery machine and set up an embroidery training centre in a neighboring village. She again took loans to buy a buffalo to support her husband to purchase a video camera and shop premises in a nearby village. Tarawati is now helping other SHG members to become economically successful. Bhagwati and her husband led a hand to mouth existence, both earning wages as agricultural labourers. Bhagwati, seeing the success of women who were members of SHGs, became a member. Despite a limited income, her access to credit made it possible for her to take a loan of Rs.15,000 for her daughter’s marriage, which she is repaying. She has also bought a cooking gas stove, a TV and increased her savings to Rs.100 per month. She has won the respect and regard of her husband and peers. For Bhagwati and her husband the future is full of promise. Sushma - from Labourer to Landlord! 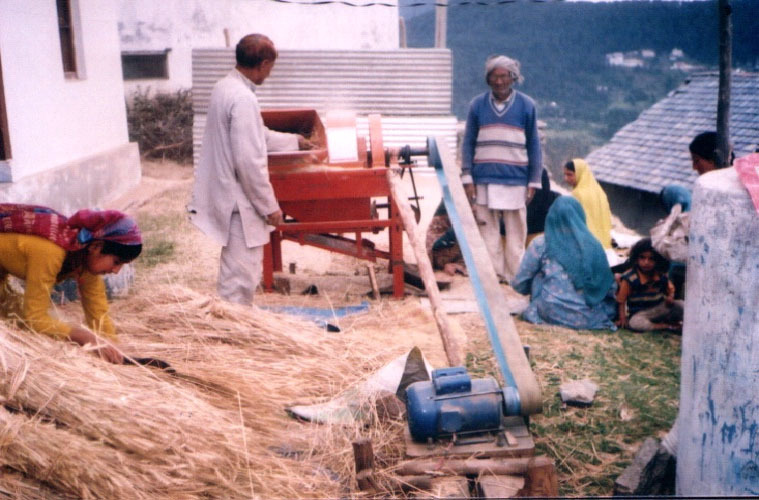 Sushma took her first loan from her self help group in Kutail Gamri and started a flour mill. She then took a loan for an auto rickshaw for her husband who is now earning well. A previous labourer in the fields of other farmers, Sushma has recently rented land, for which she herself hires labourers. She earns Rs.10,000 a month - a far cry from her previous low wages as a daily labourer. Nirmala had to support her family when her husband was jailed on a false offence. She took a loan of Rs.10,000 from her self help group to enable her husband (now released) to buy a second hand auto rickshaw. With their earnings, she repaid the loan and took another loan of Rs.15,000 to set up a grocery shop through which she earned Rs.5000-6000 per month. Now the children go to a private school and properly constructed rooms have built in the house. She has won the respect of her community and for women she has become a role model. Her advice is sought and her counsel respected. Seema Devi has brought a buffalo after taking a loan of Rs.15,000 from her self help group group. She is supplying the milk in Mangla market and earning Rs.1, 800 per month. With her savings, she has constructed a new room for her family and is very happy. Sushma w/o Salinder, joined Laxmi Mahila Bachat Samuh, with a hope to come out from poverty cycle. She took loan from Self Help Group and was able to buy an auto rickshaw for her husband. They worked hard and paid their loan in 18 months. She also managed to take 6 acres of land on rent and wants to grow off season vegetables on it. Now, Sushma is able to pay the school fee of her children and is very happy to see her family happy. Meena and her family were leading a life in hand to mouth situation depending upon labour work, which was also not a continuous source of income. After joining SHG, Meena took a loan of Rs. 10,000/- to start a mini flour mill in her village. After getting profit, she added some more grinding machines and returned the loan on time and took another loan of Rs. 30,000/- to help her husband for a “Kabari shop”. Now her husband is earning around Rs.5000/- and she is earning Rs.3000/- per month. Shri Nidia Ram, a member of the farmers’ self help group, Gajnoi, is one of the most progressive farmers of Chamba District. 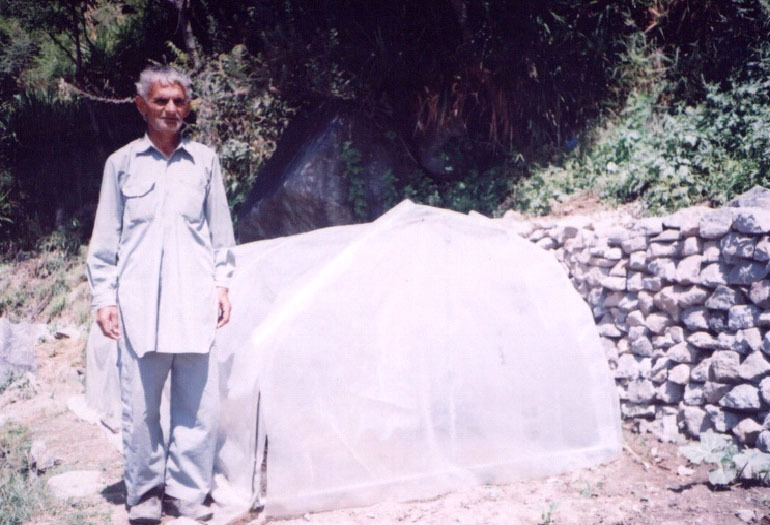 Owing to his competence in growing vegetables, he has recently had a polytunnel sanctioned from the Agricultural Department for off-season vegetables. In addition, he has recently obtained a vermi-compost pit sanctioned and constructed from the Watershed Committee sponsored by the Agricultural Department. 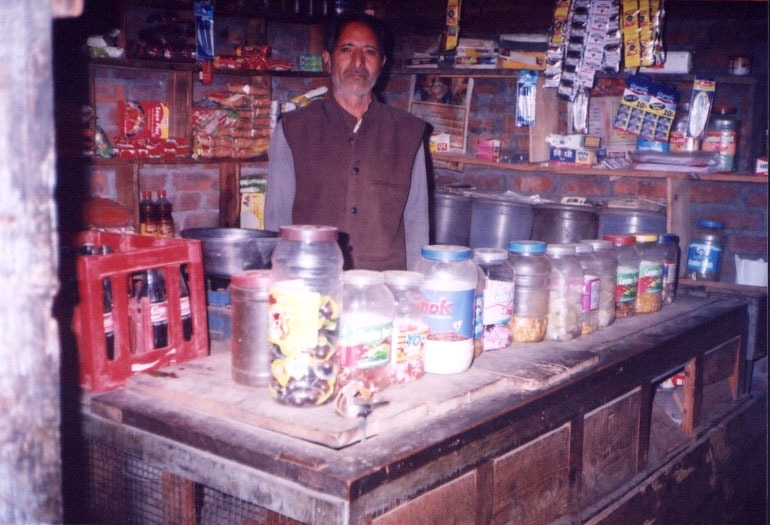 Shri Amar Singh, a member of the farmers’ group in Kakeyada, after saving money obtained from the sale of vegetables, is now running a Grocery and Confectionery shop and earning Rs.3000-4000 a month. He has realized the benefit of growing vegetables and is now very happy to have a supplementary source of income. Shri Jai Krishan, a member of the farmers’ group in Kakeyada Village, saved the money he obtained from the sale of vegetables and brought a thresher with which he is earning Rs.10,000 per season. The 9th child of poor laborers, Seema never received education. When she married, her labourer husband wasted all his money in gambling and did not allow her to work, resulting in the suffering of her 3 children. 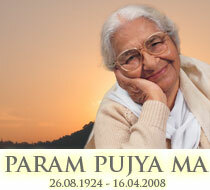 In 2008, her husband became ill with Tuberculosis (TB) and as they could not afford the treatment, he died. Later, she was also diagnosed with TB and her in-laws threw her out and shunned her. SHe started working as a labourer and earned Rs.30 per day. She took treatment for TB and recovered. Seema became a member of Self Help Group run by Arpana and started saving . She took a loan of Rs.20,000 to buy a house and repaid the group. She became a member of the Anmol Mahila Dughad Samiti and now her three children go to school,she has a permanent house and has also purchased a washing machine and bought a cooking gas. Janat was uneducated, was married at the age of 10 years, went to her in-laws house at the age of 15 and became a mother at the age of 17. Janat came in contact with Arpana’s self help group (SHG) and started saving Rs.20 per month.She took loans from her SHG, setting up new businesses to strengthen her family. She became a member of the Arpana Anmol Mahila Dugadh Samiti, which in turn, made her Vice President. Though illiterate, she did not hesitate to go outside alone to talk to shopkeepers, confectioners and college hostel to obtain orders for the Group. 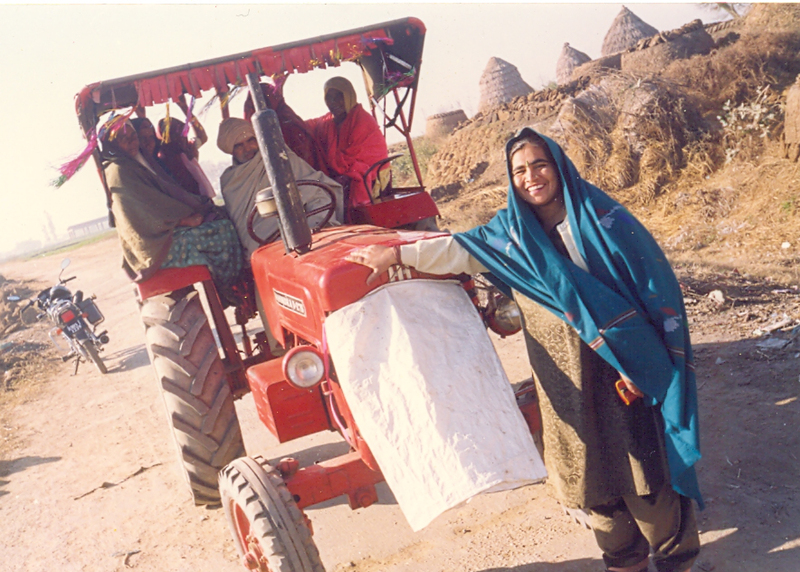 Now she is earning Rs.4000 to Rs.5,000 per month.Today she is recognized throughout the surrounding villages as the “dudhwalla” (milkman). Villagers also discuss important matters with her to get her advice. Her children are studying in a private school.